Online spirits auctioneer Whisky.Auction’s charity sale of ‘exceptional’ spirits raised more than £350,000 for environmental charities combating plastic pollution. The final total is over £150,000 more than the auctioneer’s initial estimate of around £200,000, made when the auction was first announced in September. The most expensive whisky sold was a 50-year-old Karuizawa, one of only two in existence, which fetched a hammer price of £100,100. The rare whisky was donated by spirits retailer The Whisky Exchange, with co-founder Sukhinder Singh proclaiming it ‘possibly one of the best whiskies I've ever tasted, full stop’. Auction director Isabel Graham-Yooll said: ‘Obviously the Karuizawa 50-year-old was the most spectacular star of the auction, but I was so pleased with the prices for all the bottles. 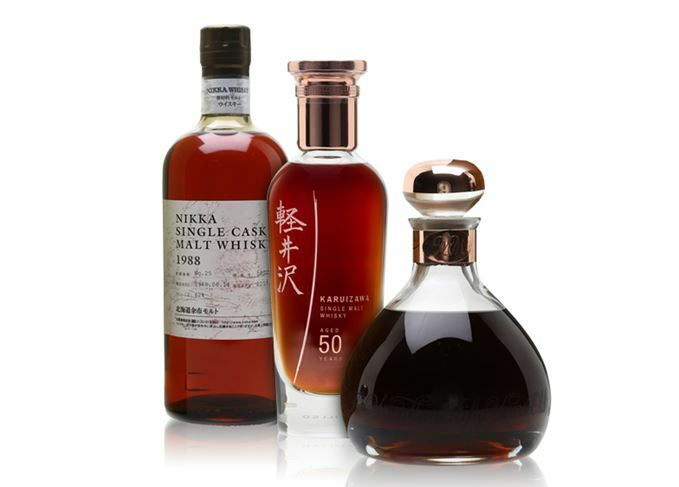 Although the Karuizawa achieved the highest hammer price of the auction, it fell short of the world record for the most expensive Japanese whisky sold at auction, set by a bottle of 50-year-old Yamazaki which sold for HK$2,695,000 (£270,000) in August. The second highest hammer price of £32,500 was earned by a 50-year-old Macallan Millennium Decanter bottling distilled in 1949, described as ‘the best Macallan ever bottled’. Other lots auctioned include a one-of-one Ardbeg 37-year-old, which sold for £30,100, a Port Ellen 38-year-old which fetched £23,600, and a single cask Yoichi from 1988 which sold for £4,800. Graham-Yooll said: ‘Distilleries and bottlers donated truly exceptional one-off bottles that were created especially for the auction, and we are proud have raised so much money for charities battling plastic pollution. The auction’s main beneficiary, the environmental charity Plastic Oceans, focuses on educating the public on the dangers of plastic pollution, placing particular emphasis on schoolchildren and changing government policy. The full list of lots and hammer prices sold as part of the auction are available at whisky.auction. Swimmers take to Islay’s waters to create a blended malt that will be sold for charity. A 1964 Bowmore, which sold for £31,000, was the highest earner at this year’s Distillers’ Auction.